Furthermore, it produced the Algerian poster of IYA-09 which was widely distributed all over Algeria. More about the genesis of the poster here. - The Ramadhan 09 Moon sighting, the bitter battle for more rationality. - Links to the various TV broadcastings. - The Third Arab Youth Meeting on Astronomy (Aug 09): The largest meeting of amateur astronomers in the Arab world for IYA-2009 ! - The Eight Salon in Popular Astronomy (Nov 09) : A large Meditteranean astronomy gathering to celebrate amateur astronomy across the borders. - The TWAN exhibit was twice at Constantine both in 2008 and 2009, as well as the Antikythera display from Athena Univ. The Cirta Science III competition organized by Sirius saw in its first stage the best 500 students from 47 High Schools competing to get a highly valued price: A travel to China to watch the Total Solar Eclipse of July 22, the longest of the century. Most of the questions of the competition were Astronomy related. 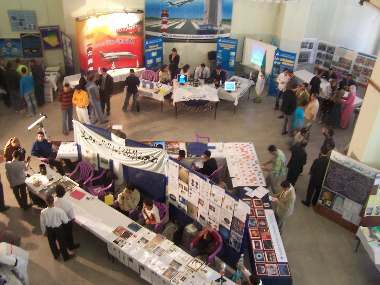 At right are some of the scenes of the competition going on. Quite a special one indeed: No computation, no hard fact to learn, just pictures and video to watch before answering the QCM. The various stages of the competition run from January to April 2009 ending with the announce of the results and the prize distribution. Click here to follow the three laureates in China. 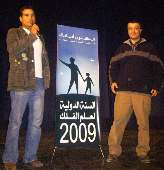 Sirius organized, in coordination with the IYA 2009 National Committee, an Astro competition during its Astronomy Salon to reward the best Algerian Amateur of the Year (Zakaria Hamdi at left is seen with Dr. Segouani, the Algeria's SPoC). The prize was paid for by the CRAAG. - The participation of Jeunes Sciences-Tunis et Djerba and SAT at our gatherings the whole year round. - A quick diaporama on this budding cooperation across the borders. “Astronomy is to physics what flour is to the baker”. The Sirius Forum, ranked among the 5 best Arab forums on the Web, has been place of exchange and a clearinghouse of ideas and projects for the Arabic speaking astronomy surfers. In particular, all the Astro news related to IYA09 fit to be put were there. The Sirius weekly Radio Program, "Nadi el-Marifa, broadcasting on Cirta-FM, every Saturday from 16:20-17:00 GMT, now on its twelfth years of activity. The Aurès Observatory project was set during 2009 on firm ground by becoming a funded national project with vital contribution of some members of the Sirius Astronomy Association : Prof J.Mimouni, the president of Sirius, and Prof.A.Bouldjedri, a Sirius founding member and now the head of the project. Furthermore, this project was also well publicized by Sirius in the media on various circumstances. In fact from its very inception the Observatory was given a public role both towards the society at large and the various astronomy associations as one can see fom the communiqué issued with the opening of the Ecole Doctorale d'Astrophysique and prepared by Prof.Mimouni its coordonateur and the Sirius president. Sirius was instrumental in laying the ground for the starting of IYA-2009 in Algeria. It devoted its Seventh National Salon of Popular Astronomy in October 2008 to the theme of the the coming astronomy year so as to give it an early kick. Those yearly Salons are international meetings as well as traditional yearly rendezvous for the Algerian astronomy amateurs. 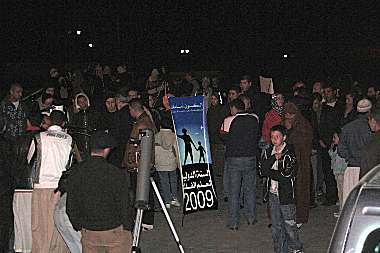 Many associations from all over Algeria participated at that Astronomy Salon and a wide range of strategic discussions were held on how best to spread the (astronomy) word during the coming 2009 year. Furthermore, Sirius initiated the constituting meeting of the National Committee for IYA-2009, in June 2008 at Algiers so as to structure the planned actions as early as possible. That Committee was designated in May 2008 after the nomination of the Spoc. Click to see the national program of the Committee. 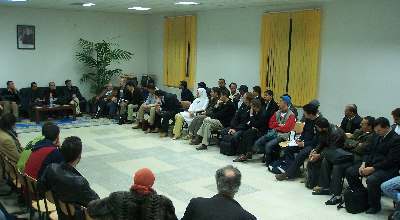 Here the planning of the IYA-2009 in Algeria at the Sirius astronomy Salon in October 2008. 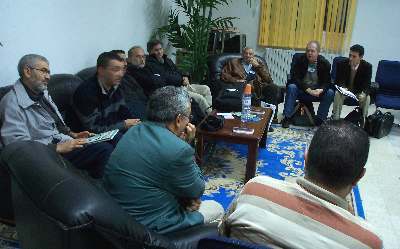 Amateur astronomy associations from all over Algeria swarmed the meeting room. ...with the participation of an international panel. We see on the picture at the left of Dr.N.Seghouani the Algerian Spoc, Prof.N. Jaidane (Light jacket) vice president of the SAT (Société Astronomique de Tunisie), while at his right is Prof. Prof X.Moussas from Athena University. Next to him is (on the same row) P.Fuentes, head of the SAF History Commission. Partly hidden next to Dr.Seghouani is R.Lassoued the AAJAA President. At the far right, crossing his hands is P.Morel the French Astronomical Society's president (SAF), and next to him (holding a notebook) Baba-Aissa from the CRAAG. Another view of the planning meeting going on. We notice seated in the foreground next to Prof.R.Attallah from Annaba University, B.Tafreshi the TWAN executive director, and few seats away (white hairs) is, Prof.G.Ferlet from IAP and president of HOU-Europe. At his left (with glasses) is Prof. Bouldjedri from Batna University and the head of the Aurès Observatory project. On the other side are Dr.Abrouche and Dr.Boudjemai, the two Algerian Space Agency representatives (ASAL), and next to them are scientists from the CRAAG (Aksouh , Fouka) at Algiers. 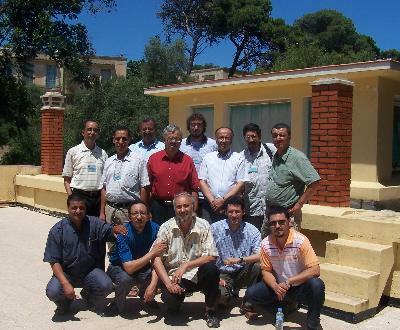 Others are mostly representatives of the Algerian amateur astronomy associations, in addition to Sirius members. 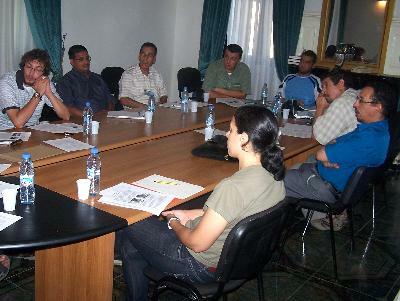 The Algerian National Committee for IYA-2009, met in June 2008 at the CRAAG at Algiers, under the leadership of Dr.Seghouani (At right talking) with the participation of associations from all over Algeria. Here the delegates in the gardens of the old Bouzareah Observatory where the meeting took place. "Outreach &Education, the key words"
To put things in context, our Association, an independent association of regional character under Algerian law, has always been very much present on the Algerian public scene ever since its inception in 1996. It was only natural for it to be mobilized for the IYA-2009, and in fact as it is widely acknowledged, it was instrumental in giving the IYA 2009 in Algeria an early start. In addition to its role in structuring the National Committee for the Celebration of IYA 2009 in June 2008 well ahead of the actual opening, it devoted its Seventh Salon of Popular Astronomy in October 2008, a large astronomy gathering that the Algerian Amateur Astronomy Sirius organizes yearly at Constantine, to the theme of the coming astronomy year so as to give it an early kick. 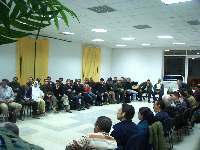 Many associations from all over Algeria participated to that National Astronomy Salon and wide ranging strategic discussions were held on how best to spread the (astronomy) word during the coming 2009 year. 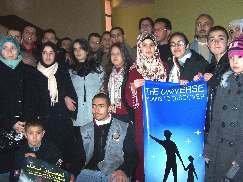 Sirius was also much present at the grand opening in Paris in January 2009, representing proudly the Algerian amateur astronomy community. How an independent, under funded, astronomy association could make a perceptible change on the astronomy scene in Algeria is a feast of significance and worthy of recognition and which may ultimately be inspiring to others. The Sirius Executive Bureau met several times during 2008 and 2009 to plan for large scale astronomy activities in due respect of the celebration of IYA2009 which will provide high visibility of Astronomy in our country. We, in particular, targeted the “100 Hours of Astronomy” as our French partners, the SAF, contacted us in this respect in 2008. We also programmed a large Arab Youth Astronomy Meeting to be held in Algeria, and put on our agenda various schools and Universities for astronomy exhibitions and talks. There is no astronomy without stargazing, and there should be no public action without sharing those night visions, so was our strong convictions at Sirius. This is why we planned from early on that we should participate at all the public sighting actions that will be organized in the context of IYA-2009. The first sighting program was incontestably the “100 Hours of Astronomy” program, one of the cornerstone programs of the year 2009. Suffice is to say that our Association won the first prize in the most coveted category of the “Most publicized 100 Hours of Astronomy registered event”. This prize is a tribute to the skills of Sirius in dealing with the various media in a most effective way, and it has been described as the most significant prize gotten by an Algerian astronomy association since the independence of Algeria in 1962! Sirius went on planning for a National Caravan for the observing the July 22 total Solar Eclipse from China, dubbed the eclipse of the century in view of the exceptionally long duration of its totality. It included the three laureates of the scientific competition Cirta Science III as well as amateur and professional astronomers from various parts of Algeria. We were proud to have set up this caravan who enabled Algeria to be represented to this exceptional astronomical event where all the Third World countries including the other Arab countries were conspicuously absents. Another great public sighting program later in the year was the Galilean Nights on the 23-24 October. Here was another opportunity to bring out our telescopes and other optical instruments and do some outreaching on public premises. Indeed, on two successive nights, a public gathering was organized on the plaza of the largest Mosque in Africa, the Emir AbdelKader Mosque at Constantine, whose location is quite suited for astronomy sighting in view of the low ambient illumination, yet convenient enough for its closeness to centre city. In addition, a rich program of lectures and workshops was going on in parallel during these days. The last significant astronomical event of the year 2009 was certainly, as far as the Euro-African and Asian countries, the partial Lunar Eclipse of December 31, 2009. 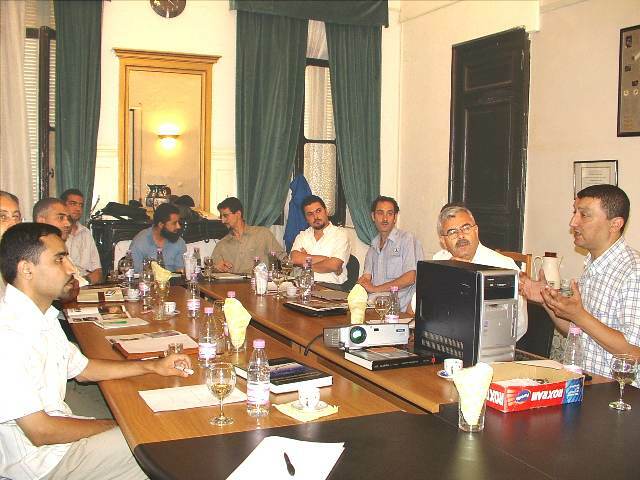 A strong media action was organized in addition to the organisation of a sighting campaign. A long string of newspapers and radios published/broadcasted the Sirius detailed communiqué on the eclipse and its circumstances while live interviews were carried out. Two international astronomy meetings were organized by Sirius during the year, one in early August 2009, the Third Arab Youth Meeting on Astronomy and Space Sciences aimed at the Arab world and with the participation of 11 countries, and the other one, more Mediterranean this time, the Eight Salon in Popular Astronomy with quite few countries from Europe and the Arab world. Those two events have drawn hundreds of participants and were open to the general public. It also featured the International exposition TWAN (The World at Night) that we borrowed from the CRAAG at Algiers where it was brought to by the Algerian Spoc. It enables the public to taste astrophotography brought to a high degree of refinement, as well as giving an international and multicultural cachet to our events, bringing home the message that Astronomy is practised under one Sky. Our association linking to two large Tunisian associations is a bright example of regional cooperation through common action. We were indeed able during 2009 to establish strong links with the two large Tunisian Astronomy Associations, namely the Tunisian Astronomical Society (SAT) and the national Association Jeunes-Science, and we involved them in all of our large activities. In return, we participated with strong delegations to their most significant 2009 gatherings. In view of the very average relationship between our two countries at the official level, there are very little cultural exchanges between them and a lack of incentive to initiate such exchanges. 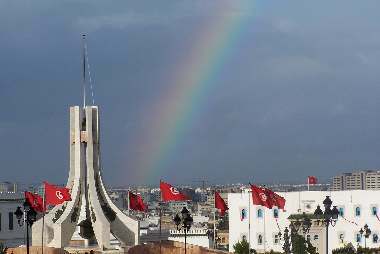 In fact, there is no regular public transportation between our two countries and all the travelling has to take place through illegal although tolerated taxis unless one travels by air, an expensive mean of transportation, especially when the only route is between the two capitals Algiers and Tunis. Now from Constantine, Algiers is farther than Tunis in land distance! Our exemplary relationship with the Tunisian astronomy associations resulted in many cross border exchanges throughout the year 2009. This crisscrossing of the common borders between our two countries will grow stronger in the future, and that is one way of breaking artificial frontiers and creating brotherly links, as well as a step in constructing a “Maghreb of the Peoples”, as opposed to a “Maghreb of the governments” confronted to the hazards of their fluctuating relationships. Our media campaign was, in a well deserved way, described as a “media blitz”: Events organized by Sirius during year 2009 were indeed shown on National TV news five times during the year (and some 15 times if counting re-broadcasting), some 50 times on National radio channels and an estimated 600 times in the various newspapers (news, interviews, communiqués…). Most of the "hits" as it were came from major operations like the "100 hours of Astronomy", the "Galilean Nights", crescent visibility for each of the start and the end of Ramadhan while the official news agency, the Algerie Press Service (APS), run bulletins from our communiqués close to 10 times. Thus, millions of people in Algeria have heard, some repeatedly, about the Astronomy events during the year, thanks to these reaching out actions. Our action toward the radios was also significant, and although it was not as prestigious as with the “heavy media” like TV broadcasting, it enables us to routinely and on short notice inform millions of people on breaking astronomical news, thanks to the high Sirius credibility. In fact, our Association has become along the years the almost exclusive reference on Astronomy for those media. Never before perhaps did the media was so intensively used for promoting Astronomy and the IYA 2009 goals. In addition, our Association provided the public with the necessary tools to understand astronomy as a science of the Universe through many local talks given by our experienced members at Elementary, High Schools and cultural centres. The University was not forgotten as quite few events were planned under the motto of: "Bringing the Intl.Year of Astronomy 2009 to the Campus", the largest one being a 3-day multi-activity event held in June at the main Constantine University campus and the Emir Abdelkader University . In addition, large astronomy expositions were held in the various other campuses, most notably at the Engineering one at Chaabat Erassas, at the School of Medicine (Chalet des Pins), and at the Veterinarian School at El-Khroub. We organized during February till April 2009 a regional competition on scientific culture, focusing on Astronomy and involving in the first stage of the selection process the best 500 students from 47 High School. The three laureates were rewarded with being part of the national scientific caravan Sirius organized to observe the total solar eclipse of July 22 from Shanghai in China. The financing of the travel was secured through a grant from the Constantine City Council (APC). In addition Sirius travelled widely across Algeria to participate and dynamise the other astronomy events, in Ain Beida, Algiers, Béjaia, Annaba, Oum El-Bouaghi, Skikda, El-Khroub… It also organized astronomy events in the Sahara desert region in the deep South, most notably at Djemaa (Wilaya of El Oued) , Guerara (Wilaya of Ghardaia) and Ouled Djellal (Wilaya of Biskra). Sirius organized a series of Astronomy Skill Building Workshops with the physics teachers in the Constantine Governorate. In all, some 150 High School physics teachers from various High Schools in Governorat benefited from the program. From the offset, the program was meant to inject new vigour to the physics teacher community battered by a big lack of vocations as physics has become greatly unpopular with the students. The enthusiasm of the teachers at those meetings surpassed our expectations and we had to go beyond the imparted time to deal with all the inquiries. - One important scholarly project carried out by Sirius and which saw the light during the year 2009 is APODAR, the Arabic mirror site of the famous NASA site APOD, standing for the Astronomy Picture of the Day. This site whose numbers of visitors already run in the hundreds daily from all over the Arab world and beyond, can be a tremendous pedagogical resource for teachers as well as a great source of inspiration for the lay people. It is a team of young Sirius members under a scientific supervision which do the daily translation and page making. - Furthermore, a new communication medium has seen the light, called "Thuraya, the Sirius Mirror". Thuraya, which is the name of the Pleiades in Arabic, has for editor is a 17 year old High School student (Hichelm Guergouri) Sirius member. The contributions are however coming from all over the Arabic world, and are under a rigorous scientific supervision. It is meant to be an electronic bulletin of news and views related to Astronomy geared in particularly to the internauts, and thanks to the Sirius site where it is available for downloading; it should quickly build up a sizeable readership. It further benefit from the members of the Sirius forum who are more widely distributed geographically while our Sirius members are mostly confined within Algeria and in particular in the Constantine area. It is thus an example of an action which uses the Internet ways of communication to the outmost. It may indeed be said that as it is becoming further delocalized, Thuraya, the Sirius Mirror will become more and more a mirror of all its readers which means basically the Arabic speaking contributors! - In addition, Sirius Voice, the Association's newsletter continued to be published, and we managed to get printed a special international issue published for the Third Arab Salon on Popular Astronomy with the participation of professional and amateur astronomers from 11 Arab and European countries! The Aurès Observatory project was set during 2009 on firm ground by becoming a funded national project with vital contribution of some members of the Sirius Astronomy Association. We mention most notably its President who spearheaded the efforts to have a National Observatory Project in Eastern Algeria so as to cater to the needs of the Graduate Study Program ("Ecole Doctorale d'Astrophysique") that he is heading at Constantine Unversity, but also Prof.A.Bouldjedri from Batna Univ., a founding member of Sirius and now the head of the project. Furthermore this peoject was also well publicized by Sirius in the media on various circumstances. 1 - It was carried out by an NGO with spare resources, building on the experience and dedication of a small group of women and men, some are professionals but most of them are university students. The sixty or so members (2/3 of them being female by the way), all worked on a voluntary basis during their spare time and none got remunerated. 2 - We must also acknowledge that most of what was done couldn’t have been possible without the freedom to assemble and carry out activities from our own choosing that enjoy scientific and cultural associations in our country. In particular we didn’t have to report to an administrative body or seek any prior permission before carrying out any activity. 3- While some part of the budget was from fund raising activities and internal resources, a good part was secured from city and state subventions. Yet the rigorous use of the tight budget was a key to success as we often were striving with extremely tight financial constraints. We believe however as a general rule that should the same activities have been carried out by a government body, the budget would have been at many fold higher for a less inspiring result. This is a tribute to the cost effectiveness of the NGO’s work. 5 - The various activities were carried out by competent members of our Association with an experience spanning many years, and under the supervision of astronomers. It also benefited greatly from the expertise of friends of the association in universities and research centers, most notably from Batna University and the CRAAG in Algiers. This allowed the activities to proceed while providing the various audiences and readership accurate, timely and relevant information. We also wish to acknowledge the excellent coordination for many of these activities with the Spoc and his role in disseminating the information. 6 - These activities, carried out during 2009, are the springboard for many others to come during the forthcoming years. We also believe that the success we obtained, especially in working with the media for a wide range of sky observing activities as well as in motivating the public, can be much inspiring to others provided provisions of point 2 above are secured. We think that our Association has done a unique job at the measure of the importance of the International Year of Astronomy 2009, in promoting the IYA2009 goals and advancing the case of public scientific knowledge. In return, we believe that the impetus provided by the IYA09 and its label helped us much in our public outreach and the receptivity of the media to our solicitations. We felt that connecting millions of Algerians to the World as it celebrated IYA through astronomy campaigns like the “100 Hours of Astronomy” and the “Galilean Nights” was a golden way to inject a hefty dose of scientific culture as it celebrated with appreciation the unity of Mankind, one under one Sky. Year 2009 ended, a new one has started, and actions initiated during that Mirabilis year will be pursued with new vigour. 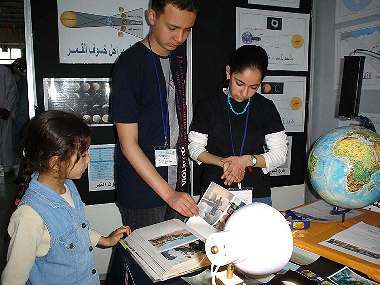 Of course other associations were involved in the IYA2009 in Algeria, and we did work hand to hand with them, yet we believe that our action in popularizing Astronomy was unique in its scope, elaborate means used, our wide and innovative ways of using the various media, and in its overall effectiveness. Thanks to all the actors, Astronomy is now more than ever part of the cultural landscape in Algeria. And indeed, in the wake of the astronomy year, tens of new astronomy clubs have sprout out across Algeria. It is important now to cater for their needs so as their existence won’t be ephemeral like dragon-flies. We, at Sirius Astronomy Association, wished to use the impact of the Intl Year of Astronomy 2009 to increase the visibility of Astronomy in Algeria, improve its public image, and leave a durable legacy both at the public level and the academic one. This may look like a titanic task for a mere astronomy association, yet as we will show, using elaborate media strategy and hard dedicated work by its 60 strong core membership, we believe we succeeded in a non small way in achieving such a goal. - We organized various public sighting campaigns, most notably the 100 Hours of Astronomy for which we got a first prize, the Galilean Nights, and the July 22 Solar eclipse from China, all well covered in the media. - At the public level, we organized a series of talks at schools and cultural centres, as well as a series of Astronomy Skill building Workshops with physics teachers. We also run a unique regional competition in scientific culture focusing on Astronomy and involving the best 500 students from 47 High Schools. - We organized two high profile amateur astronomy gatherings with a large international participation so as to further link with the neighbouring countries. We also set up an exemplary relationship with the Tunisian astronomy associations, which resulted in many cross border exchanges throughout the year 2009. - The Aures Observatory project was set during 2009 on firm ground by becoming a funded national project with vital contribution of some members of the Sirius Astronomy Association. Most notably its President who spearheaded the efforts to have a National Observatory Project in Eastern Algeria so as to cater to the needs of the Graduate Study Program that he is the head ("Ecole Doctorale d'Astrophysique" at Constantine Unversity), but also Prof.A.Bouldjedri from Batna Univ., a founding member of Sirius and now the head of the project. Furthermore, this project was also well publicized by Sirius in the media on various circunstances. Never before perhaps was the various media in Algeria so intensively solicited for promoting scientific activities and the IYA 2009 goals. We had communiqués, news, interviews flashed over the various media, from National TV to the leading newspapers and radio channels. It is no wonder also that our Association won the 100 Hours of Astronomy Award of the “Most publicised 100 Hour of Astronomy registered event”.